Harold R. Spencer Bluebird Trail. Remote Camera. 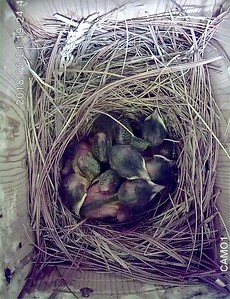 Bluebirds have experienced both record cold, and record heat. 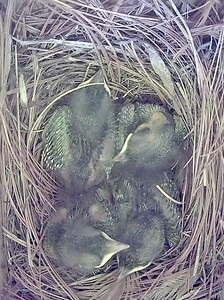 This will be the last image from the third clutch as it's unsafe to monitor the nest after the thirteenth day. The Raccoon baffle is once again saving these babies, footprints line the outside of the cylinder baffle, none of the Raccoons have been able to scale it. These attempts have only happened with the third clutch this year. I also feel that this box, the Classic 22 front opening box, with hangover roof, helps to protect from predators. iPhone image by my daughter Lindsay. 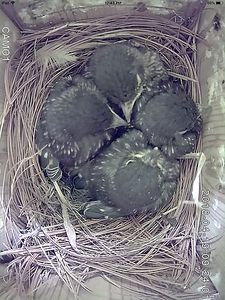 ***All four babies successfully fledged on August 5. 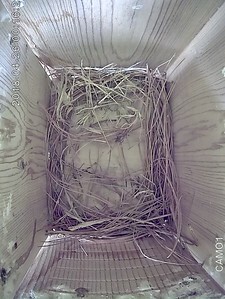 The total number of babies fledged from this box in 2018 was 13. 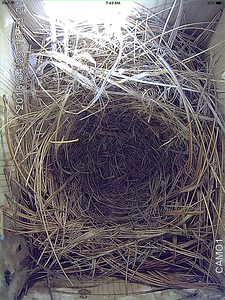 Although it only took me two days to get my nestbox camera working again, the female bluebird had already started building her third nest of the season. 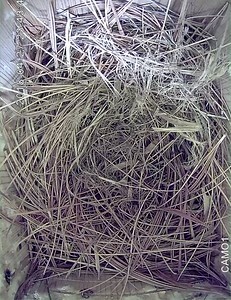 First egg of third clutch was laid on July 3, On July 6 the fourth and final egg was laid and incubation began. 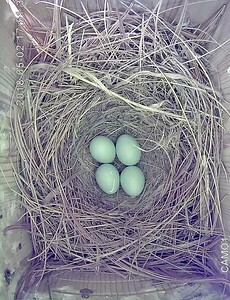 Hatch day is projected to be July 19. iPhone image taken by my daughter Lindsay. As you can see, this image was taken at 12:22 PM, when the sun is at its peak. The babies are comfortable despite the outside heat index being above 100. Sadly the camera stopped working, and I have been unable to check on how they are doing. One more day of high heat indexes...wish the camera was working. 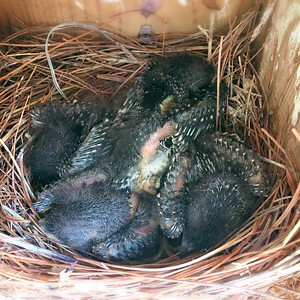 **Update; four babies successfully fledged on June 26, with the fifth baby fledging 24 hours later, on June 27, 2018 What a miracle!! The problem with my camera was the AC/DC adapter which had a wire burned off. 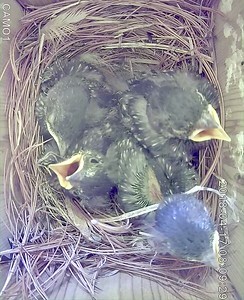 This adapter was weather sealed and not accessible while nestlings were in the box. Second day with heat indexes over the 100 mark. 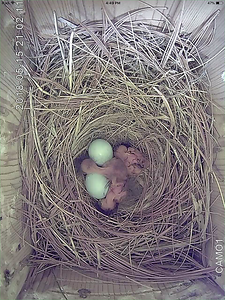 These babies are surviving because the box is under an umbrella and the box has had ice wrapped around the outside of it. 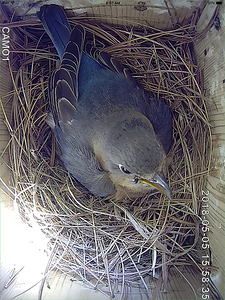 The Bluebird parents have fed their babies loyally throughout the day. 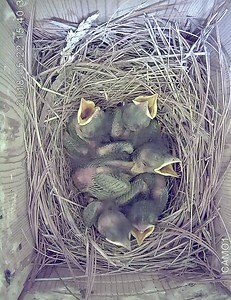 The fact that they are in an excellent bird house, made with proper ventilation is so very important. These are the things that have kept these very young babies alive. Day 7, and Day 6. 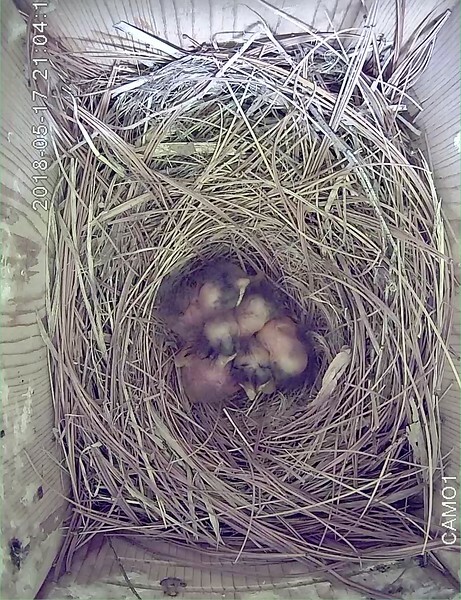 I tried my best to keep the outside of the nest box cool with ice packs, the umbrella was up as well, but it was still very hard on these young babies. The next four days are suppose to be even worse. This is very difficult. 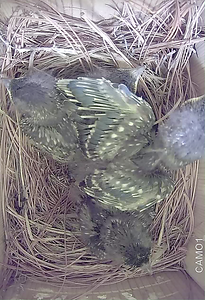 The next few days are suppose to be over 100 in heat index, the babies do not have the feathers need to help regulate their body temperature. I don't know if they will survive. This image is darker because it was raining all day. June 14, 2018. Two days old (and one day old). 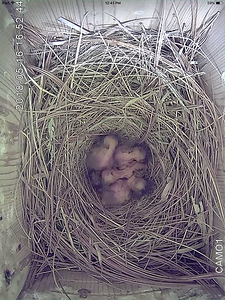 All five babies have successfully hatched. Arrow points to the last baby born one full day later than the others. 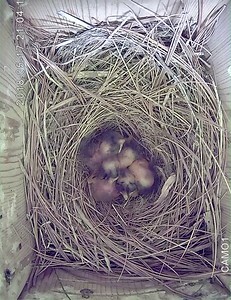 With traditional weekly nest box checks, I would only know that 5 eggs were laid, and 5 eggs hatched. 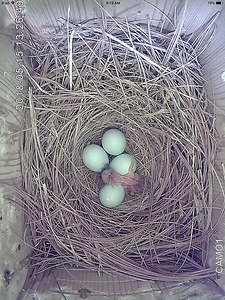 With the camera I was able to know that the female started incubating after egg 4, laying egg five the next day. 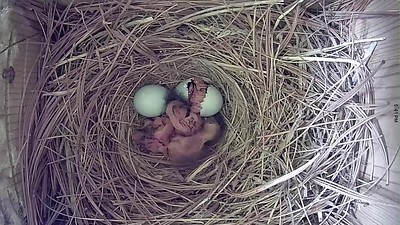 That egg 5 was born a full day after its siblings, therefore a day behind the others. 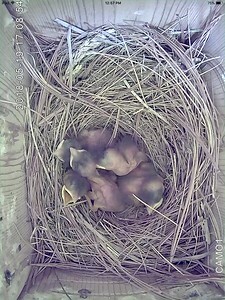 Mother bird began incubating after egg #4, then laid egg #5 a full day later. 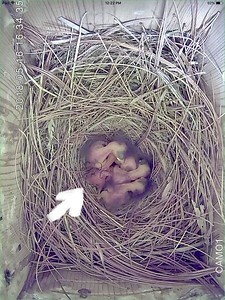 The result was that #5 hatched a full day later than the others. 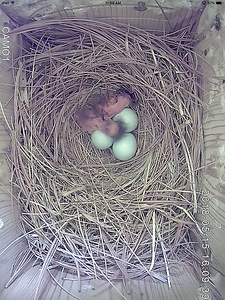 Baby #5 is much smaller than its siblings, showing how fast the babies grow in just one day. 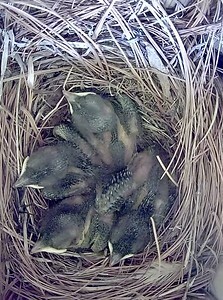 Mother bird is usually blocking the camera, so I was very excited to be able to see baby #4 hatch. Motion is in fast forward. 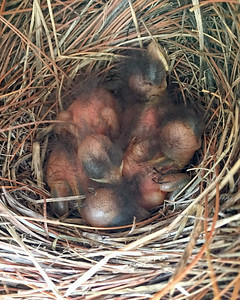 The babies were all in the yard today making a racket, Daddy bird was busy feeding them, while Mother bird continued to sit on her 5 eggs. 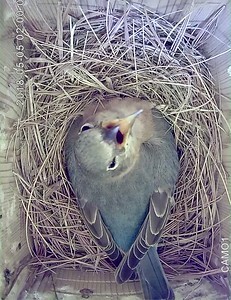 This image of the mother bluebird shows a tick! By noon the tick was thankfully gone. 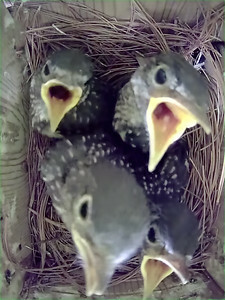 Mother bird is seen here with her mouth open, distressed by the heat. 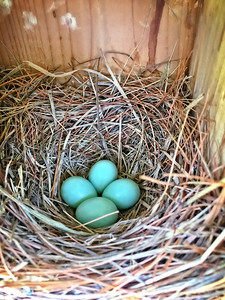 On May 26, the mother bluebird started brooding the 4 eggs. 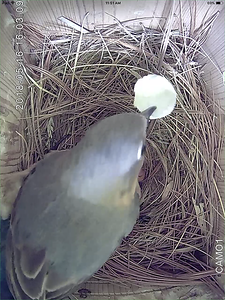 The next morning egg 5 was laid. Today, record breaking heat, 97 degrees without the heat index. 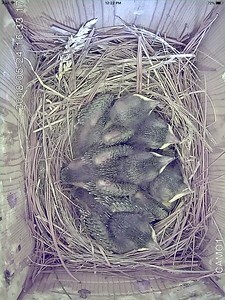 The mother bird has spent very little time in the box. 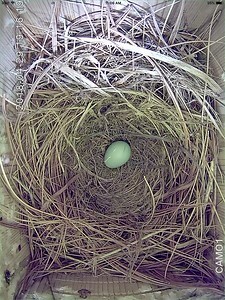 I do wonder why she started brooding a full 12-plus hours before laying her last egg, and what will result from it? 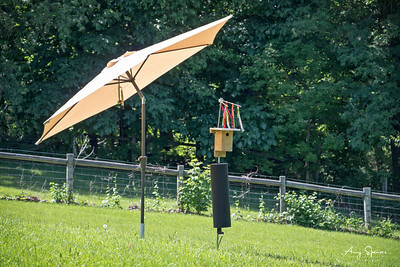 With raccoon baffle, sparrow spooker, and recently added umbrella for the hot days. 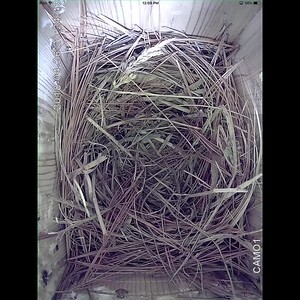 This is the Classic 22, side opening nest box, designed and built by Fred Stille. 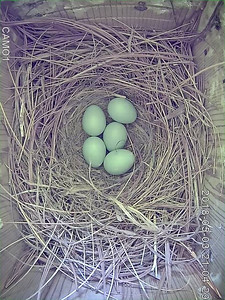 I have several different nest boxes, all excellent, but this box is my favorite. 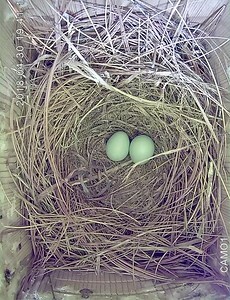 May 22, the nest waits. 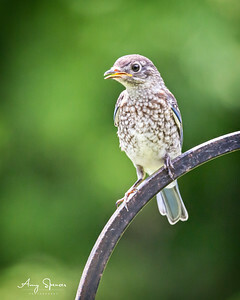 Four days after the first brood fledged, the female bluebird has started to build her second nest of the season. An empty nest, a successful fledge. Looking forward to the second clutch. 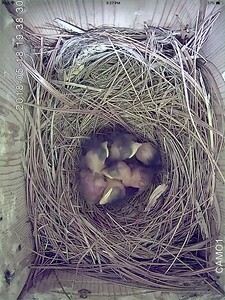 Day 16 and Fledge Day! 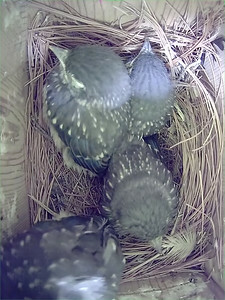 Taking turns looking out of the nest box before taking the big leap! Fledged in the early evening, I missed it of course. 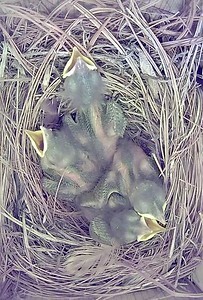 When I went outside, the daddy bird flew at my head, so I knew the babies were safe in a nearby tree. 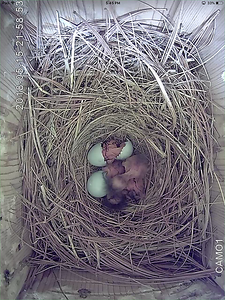 One baby is looking out of the nest box hole. 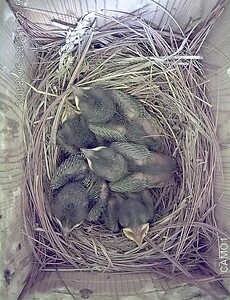 The nest box camera has been amazing, but there have been times recently that are hard to watch. Two of the babies are large, one is medium and then there is the smallest. This little one does not get its share of food since it is usually underneath the rest of them. At times it appears very weak. 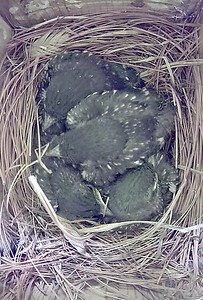 Last night was the first night the mother bird did not stay with the babies. It stormed and was very chilly. 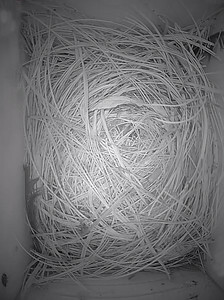 While this image portrays quiet, chaos best defines what is going on most of the time now in the nest box. 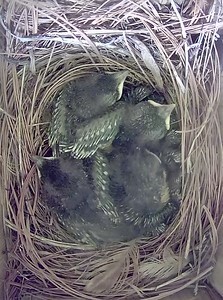 The babies are practicing with their wings, preening and fighting. 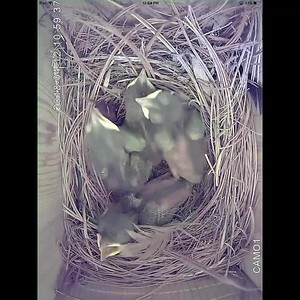 Wanted to show that the mother bird is still staying with the babies overnight. 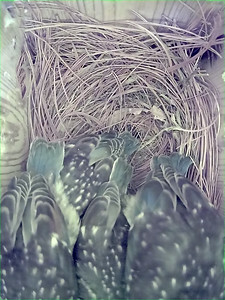 I had read that mother birds only stayed with them for one week after hatching. Perhaps it is because it is still cold at night. At the time of this image it was storming, with strong, cold wind-driven rain, something I always worry about. 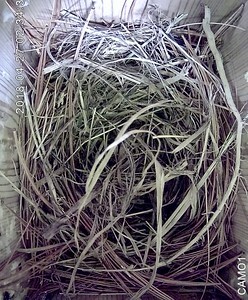 Thankfully the nest appears to have remained dry. This box was made for the heat of the summer, it's a bit larger with vents along the roof-line. These vents can be filled in during colder periods. I love this image. 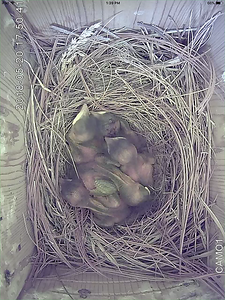 Babies are already starting to exercise their wings. Sibling fights for space also starting. 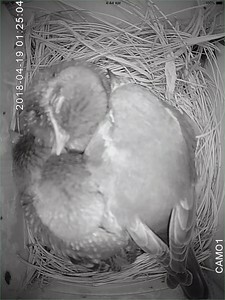 Mother is still staying in the box at night with the babies. 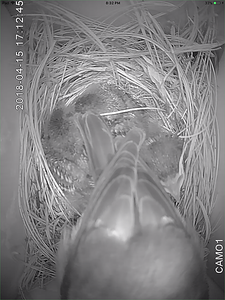 Mother bird keeps her head at the hole of the nest box, if it gets cold she sits on the babies. Night of the 9th day.